KATHMANDU, Feb 9: Concluding that the ongoing reconstruction and rehabilitation efforts were not satisfactory, the Public Accounts Committee of parliament on Wednesday directed the National Reconstruction Authority (NRA) to distribute the first installment of the housing grant within a month and the second installment of Rs 150,000 within the next three months to all the earthquake victims of the 31 earthquake-affected districts. Following a discussion with the newly-appointed Chief Executive Officer (CEO) of NRA Govinda Raj Pokharel and other officials, chairman of the house committee Dor Prasad Upadhyay directed the NRA to immediately complete the damage assessment survey in the remaining 17 earthquake-affected districts and distribute the first installment Rs 50,000 to all the eligible earthquake victims by next month and the second installment Rs 150,000 within the next three months. NRA has been distributing the first installment to the earthquake victims of the 14 districts most affected by the earthquake. Of the total 626,036 victims eligible for the housing grant in the most-affected 14 districts, NRA has distributed the first installment to 505,272 victims so far. And with the committee's directive, NRA will now have to distribute the first installment to the remaining 120,764 victims and other victims to be identified in the 17 remaining districts within a month. "The progress report on the reconstruction and rehabilitation efforts and challenges facing the NRA shared by the NRA chief suggests that the ongoing reconstruction and rehabilitation efforts are not moving ahead in an organized and planned manner and are very slow. So, we ask the authority to complete the tasks within the given timeframe and ensure that the victims languishing in the temporary shelters get permanent shelter before the coming monsoon," Upadhyay. In the meeting, CEO Pokharel said that the NRA was not able to expedite the reconstruction and rehabilitation activities due to lack of coordination among the line ministries and delay in making decisions due to the bureaucratic red tape. He said that the authority would be able to carry out its activities more autonomously and bypass procedural delays in the decision-making process if the Reconstruction Fund is immediately established. The fund allows the executive committee of the NRA to spend the money in the reconstruction works as per its necessity, there will be no need to seek approval from the Ministry of Finance, and the money under the fund does not freeze. But the draft of the working procedure for the establishment of the fund forwarded by the NRA weeks ago has not yet been approved by the Ministry of Finance. "So, due to the delay in setting up the fund, we have been forced to seek approval from the Ministry of Finance to implement any plans and activities. And we are not given approval on time, delaying the reconstruction efforts," secretary at NRA Sanjay Sharma informed the committee. He said that the procedural delay was also one of the major factors for the authority's inability to make capital expendture. The authority has been able to spend only 5 percent of its total budet of Rs 106 billion as capital expenditure. The committee directed the Office of Prime Minister and Ministry of Finance to immediately establish reconstruction fund, release all the reconstruction budget in the fund and allow the authority to work as per its necessity as it can be instrumental in expedting the reconstruction and rehabilitation efforts. The committee also directed the authority to carry out its activities by developing a time-bound plan. 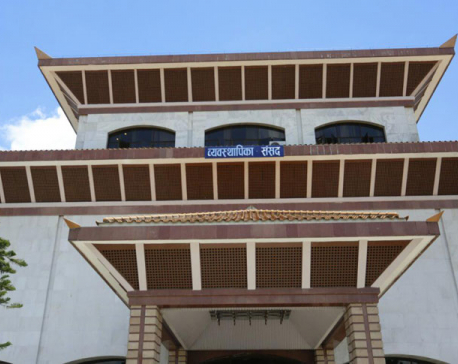 Lawmakers at the meeting had also opined that the reconstruction authority should be made more autonomous so that it can make decisions on its own and expedite the reconstruction tasks speedily.